I love spy stories set on trains. If you flick back through past posts you’ll find reviews for Sleeping Car To Trieste, Bullet To Beijing and a whole swag of spy films that feature agents carrying out their assignments in the confined compartments of a train. And it appears that I am not the only fan, because writers Robert C. Dennis and Earl Barret decided to center an episode of Get Smart around that very same premise. This episode works well as a homage to those type of films and, of course, works well as a stand alone comedy episode. The episode opens with Agent 85 traveling on board the Orient Express. Chained to his wrist is a briefcase full of cash. The money is the payroll for all the Control agents working in Eastern Block countries. In another compartment is Demetrios (Theo Marcuse). He has a short wave radio and he is in contact with another unseen agent named Kochanska. As Agent 85 prepares to hand over the payroll to his contact, Kochanska enters his compartment. Agent 85 pulls a gun, but it is too late. Kochanska has already released a poisoness gas cannister in the compartment. Agent 85 dies. In fact, Agent 85 is only the latest in a long line of agents who have died recently, trying to deliver the payroll. The Chief of Control (Edward Platt) decides to try a different tactic. Rather than sending a man again, he decides to send a woman and the agent in question happens to be Agent 99 (Barabra Feldon). 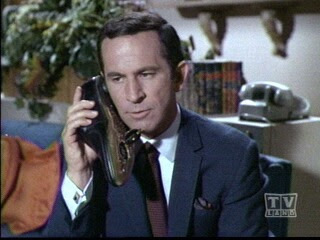 As she is receiving her mission briefing from the Chief, Maxwell Smart (Don Adams) starts to play around with the payroll briefcase. It will come as no surprise, because Max is a complete buffoon, that he manages to lock the payroll briefcase to his own wrist, and the only person with a key, happens to be the contact on the Orient Express. It looks like Max will be completing the mission rather than 99. To assist Max on his mission, from Control’s gadget department, he is given a bowler hat which doubles as a gas mask, and a pair of jet propelled shoes. Don’t get me wrong, these shoes do not allow an agent to fly. They are to make a short agent seem taller – the jet propulsion only lifts the wearer slightly off the ground. Once the mission is underway, Max is safely ensconced in his compartment when an array of characters start to enter. The first is a blind man named Ernst (Bill Glover), who happens to be a hat salesman. As one of Max’s gadgets happens to be a hat, you can be sure that there’ll be a mix up later on. The next interloper is The Countess (Carol Ohmart). There also appearances by Agent 44 (Victor French) who is hidden in the paneling on the wall and as the train conductor, Johnny Carson has an amusing cameo. As happens in this type of train bound spyjinx, the train passes through a few tunnels and the power goes out. This gives the mystery men a chance to do their thing unseen, and the usual hilarity ensues. As you’ve no doubt gathered, I am a big fan of Get Smart, and enjoyed this episode immensely. It is buoyed by the rich and time honored tradition of spy films that are set on board trains. It’s not original, but hits it’s targets.